If you've followed our past beer posts, you might quite reasonably assume that all we ever drink are light-colored hop bombs and Belgians (and sometimes combinations of the two). And, for the most part, that is indeed what we like to drink. We do, however, also have a fondness for the opposite end of the beer color and body spectrum - the Imperial Stout. 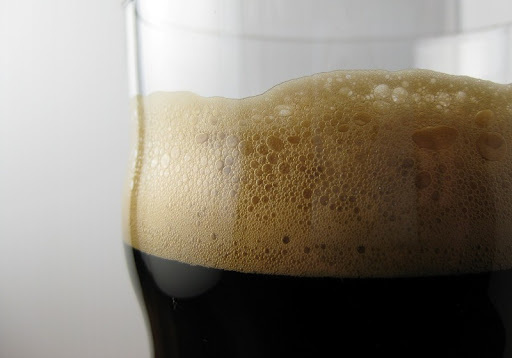 Imperial (or "double") stouts are the big boys of the dark beer family. I like mine jet black, with a motor-oil-like viscosity and punch-you-in-the-face flavor. The rich toastiness and generous alcohol level make it a great winter beer style. And the best part is that they are also comparatively easy to brew. We've spent years getting our IPAs where we want them, but this Imperial Stout came out pretty much bang-on the first time we made it. All of the effort we go through with an IPA in order to keep the color light and the malt out of the way so the hops can shine through - no need to do that here. We want it dark and malty, and that's easy to achieve. Below is the recipe we came up with. The dark color comes from the addition of Black Patent and Chocolate Malt. It surprised us how little you need to use to get the color jet-black - only around 10% of the total malt bill. Our target alcohol level was 9%, but we ended up closer to 8% (too cold a temperature during fermentation, I think). I would have been happier with the extra 1% abv, but a little bit of residual sugar works well with this style. While the grains are mashing, heat another 4-5 quarts of water to 190-195 degrees for sparging (rinsing the grains). Near the end of the 60 minutes, heat 2 quarts of water to a boil in your brew pot. After the first mash is complete, remove the cooler lid and open the spigot to draw off about 1 quart of wort into a large pitcher. The first draw will likely be cloudy with grain particles; pour it gently back into the cooler over the grain bag to help filter it. Slowly draw off the wort by the pitcher-full and carefully pour that wort into the boiling water in your brew pot. As you pull off the wort through the spigot, add the hot (190 degree) water to the top of the cooler, keeping the grains submerged at about 168 degrees. Once 4 quarts have been added to the top, cover the cooler and let it sit another 10 minutes. Use the spigot and a pitcher to draw off all of the second wort and add it to your brew pot. You should have about 3.25 gallons of wort. Bring the wort to a boil. When ready, add hops according to the schedule. With about 30 minutes remaining in the boil, begin adding the DME one cup at a time, stirring to dissolve. With 10 minutes left, stir in 1 tablet Whirlfloc. At time zero, continue adding DME off the heat until all has been added (if needed, return to low heat for a few minutes to help dissolve the extract). Cover and let sit 10-15 minutes. Move brew pot to an ice bath and cool quickly to less than 80 degrees. Transfer wort to a primary fermenter. Add water to reach the 5 gallon mark. Swirl vigorously 2 minutes then pitch the yeast. Ferment in primary for 1 week, then transfer to secondary. Keg or bottle after fermentation is complete (2 to 3 weeks in secondary). I've had some bourbon-barrel-aged beers that I've liked a lot, so I'm curious how Arne's turns out. What do you mean "beverage cooler" -- like an Igloo? Hi Mediaprophet - with the weather we've been having lately, I wish I had a batch of this on tap! Let us know how yours turns out. It already blew its lid. Switched to a blowout tube instead of an airlock and it seems to be literally "chugging along" fine now. It smells so good I want to drink it now! Yeah, that can be an issue with high-octane beers. Using an anti-foam agent helps - particularly if you use it in the air lock. We used the whirfloc. The problem was the airlock - got gummed up and pop! I jury rigged a blowout tube and that did the trick. Transferred to secondary tonight. Still darker than Dr. Pepper. Smelled and tasted great. Already at 1.036! The whirfloc is a fining agent made from spanish moss -- it helps the trub settle out for a clearer beer, but doesn't do much for foam control. You can use an anti-foam agent called Fermcap-S to help avoid fermentation blow-overs or boil-overs on the stove top. It's made so that it prevents bubble formation during high activity, but settles out of the beer when it's calm. FG wasn't any lower than at secondary. Final ABV 7.75%. Carbonated in 3 weeks (we were worried that it wouldn't, that the yeast had been lost - but it was fine). Caramel colored head. Smooth, with a little roasty bitterness. This is hands down the best recipe we've made. Compares with Great Divide's Yeti. We'll definitely make this again. We may try cherry flavoring, coffee, or bourbon-soaked oak chips to play around with it for fun. Thoughts? Glad it turned out well for you - Yeti is one of my absolute favorites, so that comparison is quite a compliment! We haven't tried adding any flavoring. I really like the oak-aged Yeti, though, so that could be a fun direction to go. Made this two weeks ago, the detailed instructions are great! I used Pacman yeast instead of what you recommended just because I wanted to try harvesting yeast(from Rogue Shakespeare). Also used Chocolate Wheat instead of Wheat (was all I could find). The O.G. came out to 1.099!! Really excited to try this in a few more weeks. What do you think about dry hopping it? I am contemplating throwing in 1-2 ounces of Centennial 2 weeks before I bottle it. Thoughts? Hi Ryno - you could try dry hopping, although I find the beer to be already fairly hoppy for a stout. That said, I'm all for experimentation! Just racked it after 11 days in primary - already down to 1.023(9.8%!) and already quite tasty. I can not wait until this is finished. Still undecided on the dry hopping, this is going to be pretty damn good as is. Made this again but withheld the roasted barley. Added 1lb bakers chocolate and 10 mangled vanilla beans instead. Lots of bitter chocolate flavor but no vanilla flavor comes through. The chocolate adds an odd mouthfeel but makes it good for a float. We might consider back sweetening the chocolate version in a future edition. Hi Mediaprophet - interesting that the vanilla didn't come through. We've never tried it, but I would have thought that adding 10 vanilla pods would produce a pretty dramatic effect. (3 gallons of water in the brewpot) Mash at 154 degrees (steep for 60 min), raise to 168 degrees (steep for 10 min), and then boil and continue with the recipe? Hi Johan, I'm not sure I'm understanding your changes - are you still brewing a partial mash (part malted grains and part dried malt extract), but all in a brewpot? The mash sounds ok, (although it's very difficult to maintain a stable temperature mashing in a brewpot on the stove top), but the second step needs to be handled differently. When mashing with cracked malted grains, the first step (at 154 degrees) extracts most of the sugars from the grain. But then the liquid needs to be drained off and fresh hot water (168 degrees) is needed to rinse the remaining sugars from the grains (sparging). If you are trying to do it all on the stove top, you'd still want two pots so that you could pull out the grain bag and rinse it with some hotter water. Your efficiency will probably be low however (less sugar obtained). I wouldn't recommend this method, but if you give it a try, let us know how it turns out. Good luck! Hello there, Sherry! For starters, I will be using the same ingredients that the recipe calls for. About keeping the temperature stable I don't really have a choice. You see... I live in Sweden where those kinds of beverage coolers aren't really common. Actually I dont think the can be found here except for in the capital maybe. Couldn't I just use on big pot and a smaller one (for sparging) and then pour it back into the bigger one? What method do you recommend then? I have read about a lot of recipes and this is the only one that involves something that can keep a constant temperature like a beverage cooler can. Hi Johan, Since you're limited to using the stove top, I'd say give it a go! I suggest keeping a close eye on the mash temperature the entire hour, and try to keep the grain bag suspended above the bottom of the pot if possible (if the grains get too hot they impart tannins into the brew.) Then yes, try sparging separately and then pour it back into the big brewpot. As for recipes, to do a grain mash the temperature always needs to be kept reasonably constant while the starches convert to sugar. Most home mash tuns are insulated even if the recipe doesn't say so, but it can be done in a brewpot -- it's just more finicky since the grain can get scorched at the bottom, and you must remove hot grains from the wort rather than just draining off the hot liquid using a spigot. Can I ask why you used the grain bag rather than just putting grain in direct similar to an all-grain. I currently do partial mashes with a pot and lid and I stopped using grain bags and converted to using a colander to strain. However, I have never used this much grain in my partial. Could you just run the spicket through a colander on its way to the brewpot? Also, were you using a converted 3 gallon beverage cooler with a metal spicket, or was it a factor spicket made from plastic? Hi Shawn, Our beverage cooler is not modified in any way -- just a big, 3 gallon plastic cooler from a sporting goods shop. I could put a baffle/strainer in the bottom instead of using a grain bag, but I would lose a little space (and I'd have to do a little work :-). While using a colander between the cooler and brewpot would be perfect for straining out grain bits, at this point I try to minimize aeration (no splashing). I've read that adding oxygen to hot wort makes compounds that can later break down and oxidize the alcohol resulting in off flavors and aromas. So I brewed this last night and decided to use grain bags. I had one large and one medium; however, they were not big enough to hold all the grain, so I put the rest straight into the cooler. One problem, the grain clogged the cooler. I ended up pouring out of the cooler into a strainer. Consistently adding the DME was also a challenge, Came out to 1.80. Next step, convert cooler using a false bottom and metal spigot. I will try again after conversion. Thanks for the recipe, I can't wait to try it. I have a couple of questions about this recipe if you don't mind. I know a lot of times these high gravity beers only get better with time(6-12mo.) How did this one age out for you? Or did it not last long enough!? Also were you satisfied with the head on this one? Would you do anything different were you to make it again? Lastly what kind of wheat malt did you use? (red?, white?, roasted?,pale?) I am looking forward to making this one soon! Thank you. I think it definitely improves with age - although it is very good right from the start. We've been very happy with the head. We've made this beer twice - we used exactly the same recipe the second time, since it came out so well the first time. The wheat malt we use is white wheat. So I brewed this beer about 4 months ago now. I stuck to the recipe pretty closely, minus some substitutions from AHS based on supply. I did add 2# of Raw Belgian Sugars. I used a 5 gallon igloo cooler, 'cause I happened to have one. I also made a starter the day before, with the high OG. I reached all of the temps perfectly and have to say that for my first true partial mash everything came out awesome. The wort tasted amazing from the start, obviously a little powerful with the amount of sugars. I left it in primary for a month, letting it settle, then transferred it to secondary on top of some whiskey-oak chips (3-4 oz) I had soaking in Bulleit Bourbon for a week (the chips were from BBQ-galore and straight from old whiskey barrels). I left it in secondary for another month and was happy I did so...there was about an inch and a half of trub after the month! I bottled and waited another month...little to no carbonation. Waited another month and the carbonation was coming in nicely. Needless to say, it tasted absolutely awesome. Each one I try tastes better and better and has developed a better head. Just a barely noticeable bourbon flavor, but everything else came through perfectly. I am extremely happy with the outcome and will def. brew this one again! Might need to soon :) thanks for the awesome recipe!! Glad it worked well for you - it is always nice to hear when someone gets a good result from one of our recipes! Question: I don't seem to see a lot of stout recipes that call for hops additions at the end of the boil like this one does. I see you're adding an ounce at the 2 minute mark, does that make for a real "hoppy" aroma or flavor in the finished product? I prefer stouts to be malty and not overly hop flavored, so I thought I'd ask before I make this recipe (not that I'll make it right now, will probably wait til end of summer or early fall so it has time to age in time for cold weather.) Thanks. We really like having the hops to balance the maltiness of a big stout like this. That said, this recipe is probably hoppier than most typical stouts, so you might want to back the hops off a bit if that is something that concerns you. This is just what I was looking for. I wanted to try a BIG stout for my first attempt at partial mash. Something with some meanness. Bought ingredients this afternoon and I'll be brewing this Sunday. Yep - it adds up. This is a relatively hoppy stout, so that adds to the cost in addition to the large grain bill to get the high ABV. If you shop around and buy in bulk, you can definitely save money on DME, which helps.